40mm stainless steel case, screw-down security crown, rubberized white unidirectional rotating bezel set with 1 diamond, sapphire crystal, white mother-of-pearl dial set with 8 diamonds, caliber UN-320 self-winding movement with date and oversized seconds hand, white rubber strap with stainless steel elements, deployant buckle. Water resistant to 300 meters. 40mm stainless steel case set with 1 diamond, screw-down security crown crown, rubberized black unidirectional rotating bezel, sapphire crystal, black dial set with 8 diamonds, Caliber UN-320 Self-winding movement with oversized seconds-hand, date, rubber strap with stainless steel elements, deployant buckle. 40mm stainless steel case set with 19 diamonds, screw-down security crown crown, rubberized white unidirectional rotating bezel, sapphire crystal, white mother of pearl dial set with 8 diamonds, Caliber UN-320 Self-winding movement with oversized seconds-hand, date, rubber strap with stainless steel elements set with 80 diamonds, deployant buckle. 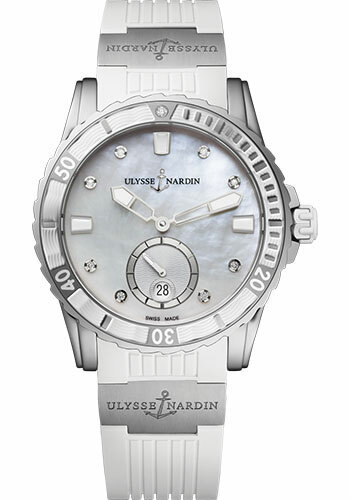 40 mm stainless steel case, screw-down security crown, rubberized bleu unidirectional rotating bezel, sapphire crystal, blue dial set with 8 diamonds, Caliber UN-320 self-winding movement with Ulysse Nardin performance certificate, oversized seconds-hand, date, silicium technology, rubber strap. Water resistant to 300m. 40mm stainless steel case set with 1 diamond, screw-down security crown crown, rubberized black unidirectional rotating bezel, sapphire crystal, black dial, Caliber UN-320 Self-winding movement with oversized seconds-hand, date, rubber strap with stainless steel elements set with 80 diamonds, deployant buckle. 40mm stainless steel case set with 19 diamonds, screw-down security crown crown, rubberized red unidirectional rotating bezel, sapphire crystal, white mother of pearl dial set with 8 diamonds, Caliber UN-320 Self-winding movement with oversized seconds-hand, date, rubber strap with stainless steel elements, deployant buckle.